This fire station was rebuilt in 2006, and has won awards for architecture and energy efficiency. 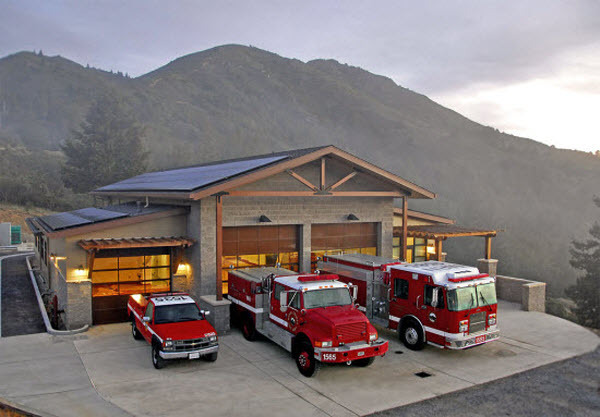 With photovoltaic electricity generation and geothermal heating and cooling, as well as 'green" materials used in all aspects of design and construction, this station is a model for future fire stations nationwide. This station is situated in a crucial location to respond to wildland fires on the southern and west Marin coast, Mt. Tamalpais, and in the urban-interface areas above Mill Valley. Protecting the community of Muir Beach, the Throckmorton Ridge fire station also responds to Muir Woods National Monument, Mt. Tamalpais State Park, and the Marin Municipal Watershed.